Many tens, if not hundreds, of amphibian species are threatened with extinction due to the emergence of the fatal fungal disease, chytridiomycosis. At present, the only way to ensure the survival of affected amphibians is to set up captive breeding programmes, but there are too many species under threat for this to be an effective strategy for all. One such species is the mountain chicken frog, Leptodactylus fallax, a charismatic frog (and the second-largest amphibian in the western hemisphere), which is only found on the Caribbean islands of Montserrat and Dominica. In February 2009, mountain chicken mortality was reported in Montserrat and chytridiomycosis was diagnosed for the first time on the island. Chytridiomycosis has now swept throughout much of Montserrat, eliminating mountain chickens from most of their range. The last effective population now occurs only in one mountain valley. The project aims to prevent the extinction of L. fallax on Montserrat by testing methods of treating mountain chicken frogs affected by chytrid in their natural environment. 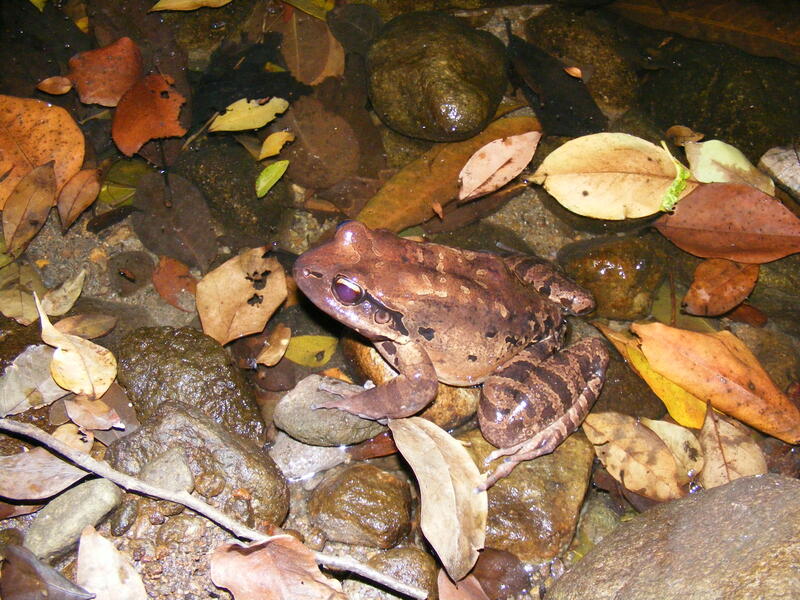 The mountain chicken frog is an ideal species to use as a model for in situ treatment because it is a large territorial animal with predictable behaviours, making it relatively easy to detect, identify and recapture. On Montserrat, the species has been studied for over ten years, so there is a great deal of knowledge about it on the island. The results of the study will be used to model L. fallax population viability with and without treatment and to inform possible in situ responses for amphibian conservation elsewhere in the face of chytridiomycosis emergence. The established antifungal drug itraconazole can be used to treat amphibians in the wild during periods of particular risk from chytrid outbreaks. Frogs were individually washed for five minutes at a time in a bag containing the anti-fungal bath. While this measure was not ultimately able to stop them dying, the paper demonstrates that this technique has potential to greatly extend the likely time to extinction for any given amphibian population in the face of epidemic disease. The news was published in the journal Biological Conservation and you can find out more information on our news pages. There is more about our project, Montserrat and its wildlife in the mini documentary from Redfern Natural History Productions below.